MPTC Master Instructor Joe Picariello is currently planning to conduct several classes open to our membership. 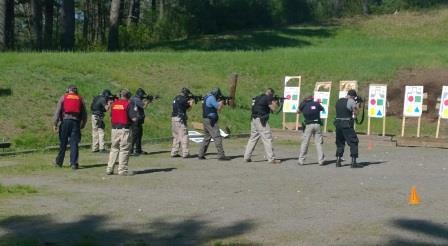 Tactical Shotgun Class: One day tactical shotgun class on April 27th at the Worcester County Sheriff Department range. Cost $100 for members. New 56 Hour Class: A seven session program scheduled for October 2019 - details below. Pricing will be dictated by the number of students. 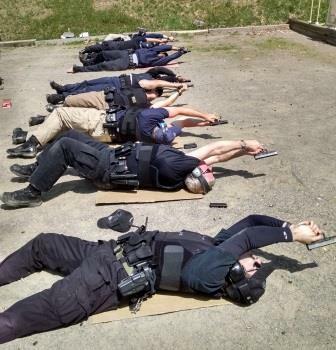 Officers from Boylston Academy, Framingham, Hatfield, Hubbardston, Lawrence, Oakham, Somerville, Warren and Winchenton at the Spring 2015 MPTC 20Hr Reserve Firearms training class. This course was a great balance of training. The instructors were informative and knowledgeable. They knew the material and broke it down in simple terms and made the complex basic. They helped me take the basic material and see it from a new perspective. I’d suggest this training to anyone, because I was able to pick up on my mistakes and focus on the tips and direction the instructors gave, so in the future when I train on my own I will have more confidence in practicing correctly. The drills were great they broke up the day and indirectly made us utilize all lessons learned throughout the training. All instructors have earned the title “Master Firearms Instructor” so if you are looking to train, learn, tweak, or just get better acquainted with your firearm? I highly recommend this class, it’s worth every penny and centralized in the state to accommodate all. I want to thank you for organizing the MA-VLEOA 20 hour range qualification course. I took this class last year, however missed the last day. I retook the entire course again this year. 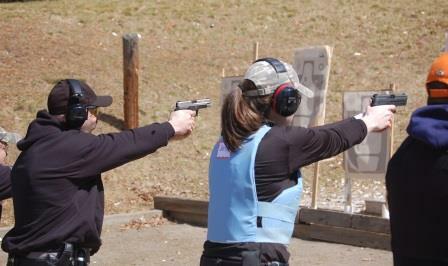 The vast knowledge of all of the range instructors is amazing. I learned so many little "pearls" of information. I highly recommend this class to ALL law enforcement personnel. I am proud to be a member of MA-VLEOA and look forward to an advanced shooting class and hopefully one on long rifles/shotguns. Here are some comments submitted by officers how have attended this training. It shall be the purpose of the Massachusetts Volunteer Law Enforcement Officer Association to promote the ideals, goals, general welfare, and professionalism of the volunteer law enforcement officers of the Commonwealth of Massachusetts. …support the professional development of the volunteer law enforcement officers of the Commonwealth of Massachusetts by conducting and or facilitating training programs, recognition programs, and other services that the association may be better suited to provide. …foster and promote mutual cooperation between the volunteer law enforcement agencies throughout the Commonwealth while also supporting and facilitating positive relationships between the volunteer law enforcement officers, the career officers, and the general public which, together the career and volunteer officer serve. …provide a unified voice for volunteer law enforcement members of the various town, city and county volunteer law enforcement officer units and associations, before the Great and General Court of the Commonwealth, the Executive Offices of the Commonwealth and to all appropriate State agencies. On June 29th the MA-VLEOA sponsored a day of training at Clark University where officers learned about large scale disasters with experiences from the Waldo Canyon and Black Forest Fires in Colorado and were trained in Incident Response to Terrorist Bombings, from New Mexico Tech www.nmt.edu. 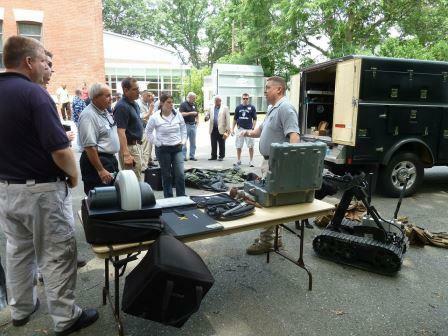 We also had a visit from the Massachusetts State Police bomb squad and learned about the equipment they use. Funding for this training was provided through a Grant from MEMA www.mass.gov/mema. Victoria LeBlanc, President of Massachusetts Law Enforcement Support, is the driving force behind the Massachusetts Law Enforcement Support License Plates. She saw that there were license plates to support law officers in other states but that they were not available in Massachusetts so she set out to make that happen. 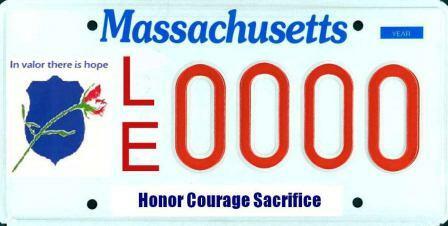 She contacted the National Law Enforcement Officers Memorial Fund (NLEOMF) and received permission to use their logo on the plates and then contacted the MA DOT to get the process rolling. 50% of the proceeds from the license plates will benefit the NLEOMF and the other 50% will go to local Massachusetts police officers and their families. You can choose your own number for your plate - between 100 and 3000 (numbers only - no letters). All plates under 100 are reserved for families of fallen officers. We will be doing something special with any low number plates remaining so stay tuned - we'll make an announcement. Before the plates can go into production we need 3,000 pre-paid applications. If you'd like to support your local Massachusetts police officers and their families please download the application by clicking here, fill it out and mail it to Victoria LeBlanc, PO Box 890296, Weymouth, MA 02189. Please include a check in the amount of $40 made payable to the MA DOT. FAQ's and Information on ordering can be found by clicking here or by visiting the Massachusetts Law Enforcement Support website by clicking here. If you are currently enrolled in the MPTC Reserve Academy, or are planning on attending this spring you to may be eligible to receive a scholarship. The MA-VLEOA is currently accepting applications for the awarding of a $500 Officer Sean Collier scholarships to the MPTC Reserve Academy. Applications will be accepted through March 15, 2019 and the scholarship recipients will be announced on April 18, 2019. Winthrop Auxiliary Sergeant Louis Massa - Recipient of the Sean Collier Scholarship Award. 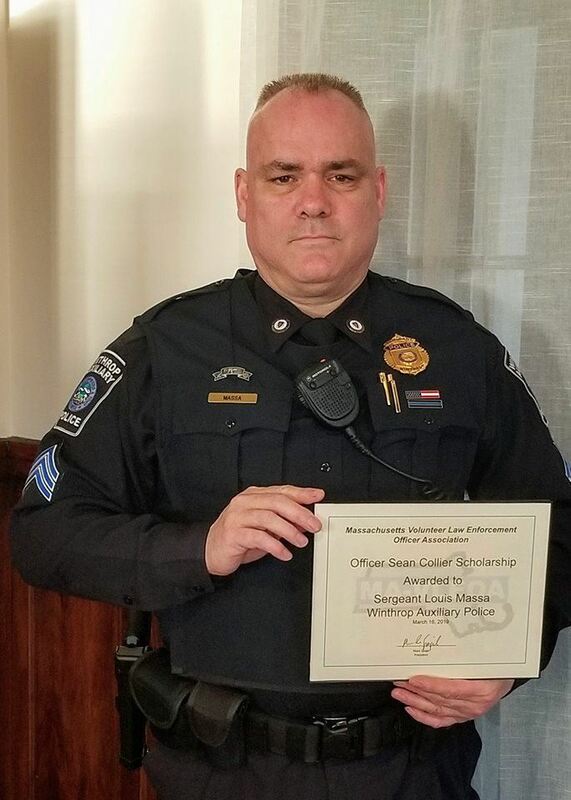 The second Sean Collier Scholarship was awarded to Auxiliary Sergeant Louis Massa of the Winthrop Auxiliary Police Department. Louis graduated from the Municipal Police Training Committee (MPTC) Reserve Academy in December 2017 and is looking forward to continuing his Law Enforcement career through volunteering with the Winthrop Auxiliary Police, as he has done for the past eight years. The Officer Sean Collier scholarship was established in 2013 to honor the memory of Officer Sean Collier who was killed in the line of duty on 18 April 2013 while working with the Massachusetts Institute of Technology (MIT) Police Department. 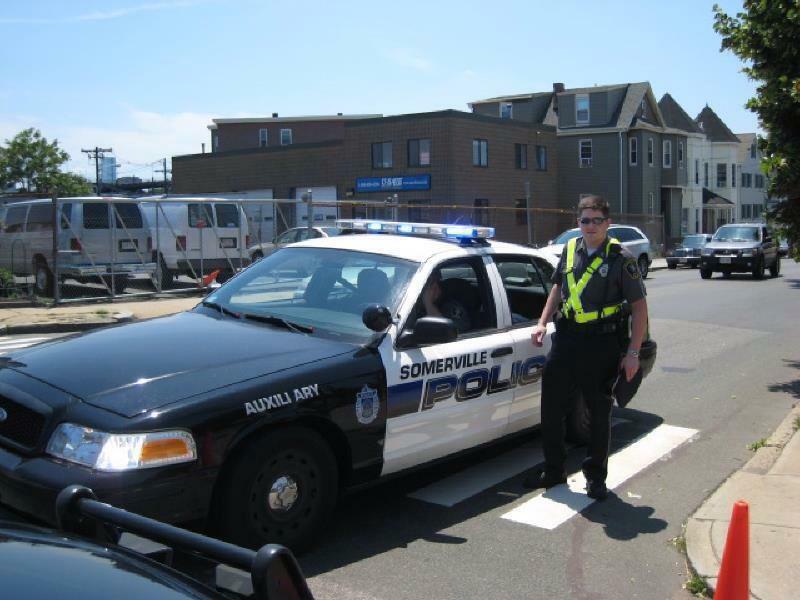 Officer Collier started his law enforcement career as an auxiliary officer in Somerville, Massachusetts. Through the efforts of the MA-VLEOA, this scholarship will ensure that Officer Collier’s name remains in the forefront of auxiliary and reserve officers in the Commonwealth of Massachusetts by providing scholarships to the MPTC Reserve Academy. Applicants must be either planning to attend an academy or currently attending an academy at the time of application. Applicants must be members in good standing of the MA-VLEOA, through either an individual membership, or as part of their Department’s membership at the time of application through payment of the scholarship. Awards will be made by a committee based on a review of your application and essay. Any Scholarships awarded will be paid to the applicant after one year of post academy volunteer service with their agency. This is a competitive process, with limited awards. MEMA announced the next round of Grant Awards that were made in September 2015. MEMA received 66 applications with a total funding request of over $277,000. Through a competitive application process awarding available funds, MEMA was able to provide a total of $148,000 to 42 CERT and 3 VIPS units. MA-VLEOA applied for but, unfortunately, was not granted any additional funding for state-wide VIPS training with this Grant. We hope to bring some training to you in the future, but it will not have the funding support as we have had in the past. The MA-VLEOA continues to advocate VIPS programs to the Statewide Citizen Corps Council. 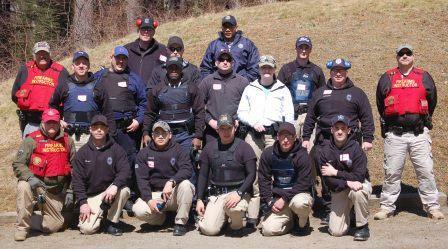 The MA-VLEOA is a membership based association that supports Massachusetts Law Enforcement Volunteers. Support your organization by wearing MA-VLEOA Logo Gear. On June 2nd 17 Officers from Everett, Revere, Framingham, Natick, Winthrop, Somerville, Chelsea P.D. 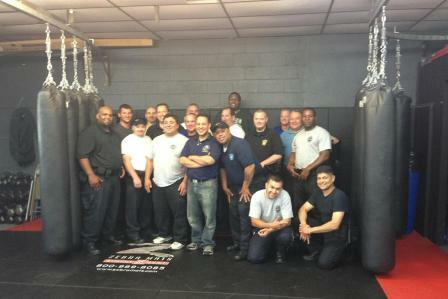 Boston School Police , and NYPD Aux took part in Defensive Tactics Training in Revere. The class was taught by Chelsea Officer Jose Ramos. 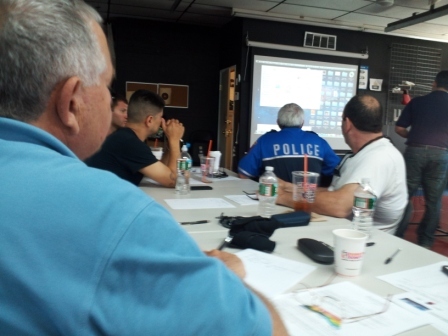 Revere Auxiliary Officer Georges Coles took the lead in coordinating the class. MA-VLEOA helped with getting the word out. It is an excellent and repeatable example that demonstrates the power of working as one team. If you have a training need contact the MA-VLEOA. We can help you locate instructors and communicate the training opportunity to our members. 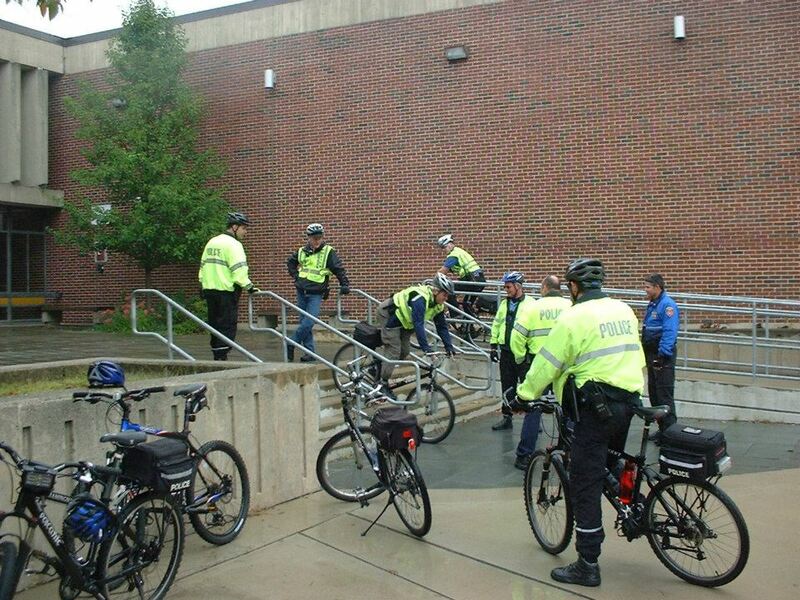 The Framingham and Natick Auxiliary Police units have embarked on a 32 Hour International Police Mountain Bike Association (IPMBA) Police Cyclist course. www.ipmba.org Framingham Police Sergeant Bob Sibilio, an IPMBA instructor, is teaching the class. The training course consists of 8 hours of classroom, and 24 hours of "on seat" training. Please send news and updates about your unit to the MA-VLEOA for inclusion on this page. Are you tired of tracking hours and training on spreadsheets? Are you tired of making phone calls to fill shifts events? Are you tired of all your manual administrative paperwork? If so please check out VIMS - The Volunteer Integrated Management System. The following Massachusetts Auxiliary agencies are currently using VIMS to simplify their administrative duties. Haverhill, Framingham and West Springfield. VIMS will make a donation to the MA-VLEOA for 30% of your first year subscription. Click on the logo below to find out how you can save on administrative time and effort.